You may got to the home of SkyWatch Friday to find skies around the world. But they're friendly looking ones at least. Unlike yesterday's. Dear Carver, this sky is perfect, perfect shot! Nice .. pouffy and not rain clouds!!! What a gorgeous capture, Carver!! 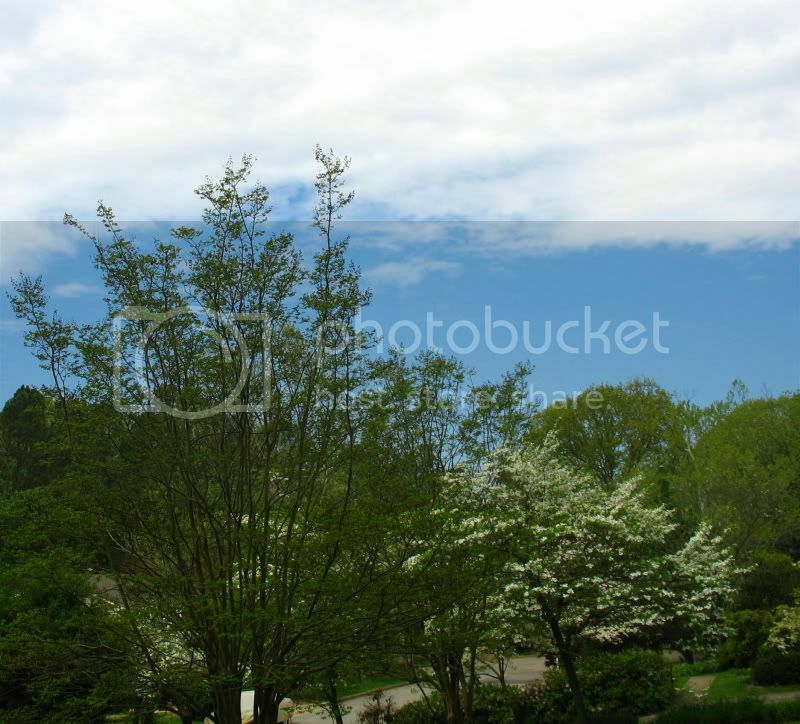 Such lovely clouds and beautiful green and flowering trees! Superb! And it did take my breath away! Have a lovely weekend! Green, blue and white. Perfect combination! Ohhh take me there :-) away from the rain, please. Nice weekend to you Carver. They are beautiful clouds. That is the beautiful green of spring, too. Lovely. I feel the blue wont last long! Nice sky! And isn't it so nice to see all the green! Love the greens and the blue sky! Happy weekend! What a beautiful image! Great shot, Carver! What a giant sky over those trees! And, a beautiful one too! Enjoy the great days of spring. But you have leaves on your trees! Looks like beautiful sky and a nice day. Wonderful photo, Carver. Nice shot! I can feel those clouds drifting softly down! Have a great weekend! Fantastic combination of white, blue and green! Nice one. Have a great weekend. Carver, down the road, I'd recognize that beautiful sky anywhere! We're in the same stage of spring over here. Miss hearing from you. Look at that wonderful Spring sky..simply perfect!!! Oh, carver, you make me homesick for springtime in the South!